Gene Therapy Keeps 'Bubble Boy' Disease At Bay In 8 Children : Shots - Health News Earlier efforts to use gene therapy to treat a rare immune disorder in young children failed when some of the children got leukemia. Scientists say they think they may have figured it out, with eight children now living normal toddler lives. "They live pretty normal lives," investigator David Williams tells Shots. "It's amazing. Without treatment, it's a pretty uniformly fatal disease." Equally important, these children are so far showing no signs of the cancers that developed a decade ago in 5 out of 20 children given an earlier version of the same gene therapy. Those treatment-related cancers temporarily brought such gene therapy experiments to a screeching halt. The latest gene therapy experiment used a "self-inactivating" virus to deliver the corrective gene into the children's blood stem cells. This new viral vector apparently doesn't flip switches that give rise to leukemia, as the old vector did. "We're not saying these children are completely free from any risk," says Williams, who was to report on the trial Saturday morning at the American Society of Hematology meeting in New Orleans. "But we're quite happy with the results we have so far and feel confident that the vector is safer in every way we can look." Williams works with the Cancer and Blood Disorders Center at Boston Children's Hospital and Dana-Farber Cancer Institute. He says one of the nine children died of an overwhelming infection that he had "before the gene-corrected cells could fully engraft and fight off the infection." One other child didn't get as much benefit from the gene therapy as hoped. He's going to get another dose of the gene-corrected stem cells. Researchers give each child between 2 million and 10 million genetically engineered stem cells after the gene that they lack, called the IL-2 common gamma chain receptor gene, has been inserted into a mouse virus. The cells come from the children's own bone marrow. Once the gene-corrected cells are infused back, they multiply and stimulate the production of normal immune cells. The technology component of this gene therapy costs from $125,000 to $250,000 per patient, with additional costs for medical care. So far the National Institutes of Health has paid for it. Williams says two of the eight surviving children — one in Paris, the other treated in Boston and living in his native Argentina — had the new gene therapy more than three years ago, when they were infants. 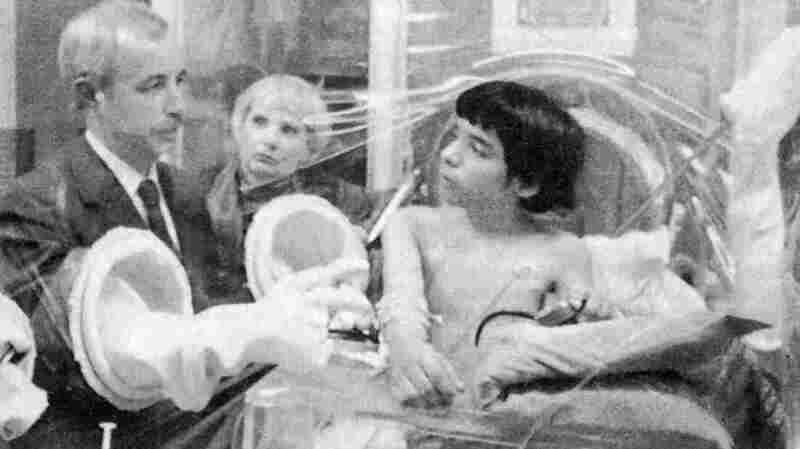 They have reached the age when some of the children in the earlier experiment developed leukemia. Researchers in Paris, London, Boston, Cincinnati and Los Angeles have been scrutinizing their young patients' blood cells regularly for signs of abnormal growth or evidence that virally introduced genes inserted themselves into places in the genome known to be hot spots for triggering leukemia. They haven't seen any ominous signs, which is why the researchers are feeling cautiously optimistic that they've surmounted the leukemia problem. Curiously, separate research projects in California and Italy, involving about 40 children with a different form of genetic immune deficiency, have not seen leukemia, either — even though that group has been using the original virus vector. One sign of the new optimism over gene therapy is that other trials are starting up. The Boston group has three others going, with two more in the works. They involve SCID-X1 and other rare diseases, such as metachromatic leukodystrophy and Wiskott-Aldrich syndrome. But the group is dreaming big. Within the next year, Williams says they're planning to test gene therapy for sickle cell disease and thalassemia, two much more common blood disorders that together affect hundreds of thousands of people in this country. That's a clue that researchers — and regulators, such as the Food and Drug Administration and the National Institutes of Health's Recombinant DNA Advisory Committee — are starting to feel comfortable enough with gene therapy that they're entertaining the idea of applying it to diseases that are not quickly fatal without treatment. "All new technologies start out with a boom and then with some regularity have some unexpected side effects that have to be addressed," Williams says. "That's exactly what's happened in this field."